This Our Still Life is the most recent solo feature documentary work from Andrew Kötting (Gallivant, Ivul), a deliciously eccentric portrait of the remote tumbledown Pyrenean farmhouse where the filmmaker, his wife Leila and daughter Eden have lived on and off for more than 20 years. Premiered at the 2011 Venice Film Festival and released in cinemas by the BFI last November, it comes to DVD on next month with three extra films and a comprehensive booklet. "Ten years ago Eden and I started drawing 'Still Life' together and I found that I arrived at a meditative state of mind through this process... More often than not we were living in our isolated Pyrenean farmhouse when we made these drawings. The house is called 'Louyre' and is up a track deep in the forest, underneath the shadow of a very tall mountain. Our lives there were a million miles away from the hubbub of London living. "Eden was a baby when we moved in so the place is full of memories. I started to document our lives together on a Super 8 camera in 1989 and then again with a cheap digital stills camera in 2004. A portrait of 'Louyre' began to appear, but it wasn't until the Christmas of 2006, when I was watching Stan Brakhage's Dog Star Man, that I decided to start editing the material." This lo-fi treat features music by Scanner's Robin Rimbaud and a range of voices from Kötting's sound archive to explore notions of nostalgia, memory and place. It evokes a way of life which is elemental and rudimentary, unhurried and at odds with the modern world. As the seasons revolve, voices in the filmmaker's head seem to question the purpose of existence, but all attempts to impose meaning and structure remain inconclusive and fragmentary. A fairytale atmosphere is conjured up, not devoid of sinister or melancholy undertones, but full of magic and mystery, riotous colour and the play of light. 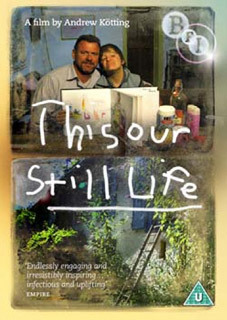 This Our Still Life will be released on UK DVD on 19th March 2012 by the BFI at the RRP of £15.99. 32-page illustrated booklet featuring essays by John Roseveare, Iain Sinclair and Sukhdev Sandhu and drawings by Andrew and Eden Kötting.